سنة 1898 (MDCCCXCVIII) كانت سنة بسيطة تبدأ يوم السبت (الرابط يعرض التقويم كاملاً) التقويم الگريگوري، السنة 1898th بعد الميلاد (م)، السنة 898th في الألفية 2، السنة 98th في القرن 19، والسنة 9th في عقد 1890 بين 1583 و 1929 ومع فارق 1898 is 12 يوم عن التقويم اليوليوسي، والذين ظلوا مستخدمين حتى التحول الكامل إلى التقويم الگريگوري في 1929. 1 يناير – New York City annexes land from surrounding counties, creating the City of Greater New York as the world's second largest. The city is geographically divided into five boroughs: Manhattan, Brooklyn, Queens, The Bronx and Staten Island. January 13 – Novelist Émile Zola's open letter to the President of the French Republic on the Dreyfus affair, J'accuse…!, is published on the front page of the Paris daily newspaper L'Aurore, accusing the government of wrongfully imprisoning Alfred Dreyfus and of antisemitism. February 12 – The electric car belonging to Henry Lindfield of Brighton rolls out of control down a hill in Purley, London, England, and hits a tree; thus he becomes the world's first fatality from an automobile accident on a public highway. February 15 – Spanish–American War: The USS Maine explodes and sinks in Havana harbor, Cuba, for reasons never fully established, killing 266 men. The event precipitates the United States' declaration of war on Spain two months later. February 15: USS Maine is sunk. February 23 – Émile Zola is imprisoned in France after writing "J'accuse". March 24 – Robert Allison of Port Carbon, Pennsylvania, becomes the first person to buy an American-built automobile when he buys a Winton automobile that has been advertised in Scientific American. March 26 – The Sabie Game Reserve in South Africa is created, the first officially designated game reserve. April 5 – Annie Oakley promotes the service of women in combat situations with the United States military. On this day, she writes a letter to President McKinley "offering the government the services of a company of 50 'lady sharpshooters' who would provide their own arms and ammunition should war break out with Spain." In the history of women in the military, there are records of female U.S. Revolutionary and Civil War soldiers who enlisted using male pseudonyms, but Oakley's letter represents possibly the earliest political move towards women's rights for combat service in the United States military. 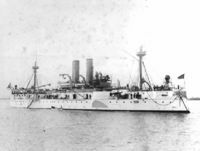 April 22 – Spanish–American War: The United States Navy begins a blockade of Cuban ports and the USS Nashville captures a Spanish merchant ship. April 25 – Spanish–American War: The United States declares war on Spain; the U.S. Congress announces that a state of war has existed since April 21 (later backdating this one more day to April 20). April 25 – In Essen, German company Rheinisch-Westfälisches Elektrizitätswerk RWE is founded. April 26 – An explosion in Santa Cruz, California, kills 13 workers at the California Powder Works. May 1 – Spanish–American War – Battle of Manila Bay: Commodore Dewey destroys the Spanish squadron. The first battle of the war, as well as the first battle in the Philippines Campaign. May 2 – Thousands of Chinese scholars and Beijing citizens seeking reforms protest in front of the capital control yuan. May 7 –May 9 – Bava-Beccaris massacre: Hundreds of demonstrators are killed when General Fiorenzo Bava-Beccaris orders troops to fire on a rally in Milan, Italy. May 8 – The first games of the Italian Football League are played. May 12 – Bombardment of San Juan, the first major battle of the Puerto Rican Campaign during the Spanish–American War. May 27 – The territory of Kwang-Chou-Wan is leased by China to France, according to the Treaty of 12 April 1892, as the Territoire de Kouang-Tchéou-Wan, forming part of French Indochina. May 28 – Secondo Pia takes the first photographs of the Shroud of Turin and discovers that the image on Shroud itself appears to be a photographic negative. The original flag of the Philippines as conceived by General Emilio Aguinaldo. The blue is of a lighter shade than the currently mandated royal blue, the sun has eight points as currently but many more rays and it has a mythical face. June 1 – The Trans-Mississippi Exposition world's fair opens in Omaha, Nebraska. June 7 – William Ramsay and Morris Travers discover neon at their laboratory at University College London after extracting it from liquid nitrogen. June 9 – The British government makes a 99 year rent of Hong Kong from China. June 12 – Philippine Declaration of Independence: General Emilio Aguinaldo declares the Philippines' independence from Spain. June 13 – Yukon Territory is formed, with Dawson chosen as its capital. June 21 – Spanish–American War: The United States captures Guam making it the first U.S. overseas territory. July 1 – Spanish–American War: Battle of San Juan Hill – United States troops including Buffalo Soldiers and Theodore Roosevelt's Rough Riders take a strategic position close to Santiago de Cuba from the Spanish. Spanish–American War: Battle of Santiago de Cuba – The United States Navy destroys the Spanish Navy's Caribbean Squadron. Joshua Slocum completes a 3-year solo circumnavigation of the world. July 4 – En route from New York to Le Havre, the ocean liner SS La Bourgogne collides with another ship and sinks off the coast of Sable Island, with the loss of 549 lives. July 7 – The United States annexes the Hawaiian Islands. July 17 – Spanish–American War: Battle of Santiago Bay – Troops under United States General William R. Shafter take the city of Santiago de Cuba from the Spanish. July 18 – "The Adventures of Louis de Rougemont" first appear in The Wide World Magazine, as its August 1898 issue goes on sale. July 25 – Spanish–American War: The United States invasion of Puerto Rico begins with a landing at Guánica Bay. August 12 – Spanish–American War: Hostilities end between American and Spanish forces in Cuba. August 20 – Opening of the Gornergrat railway, connecting Zermatt to the Gornergrat. August 21 – Clube de Regatas Vasco da Gama is founded in Rio de Janeiro, Brazil. August 23 – The Southern Cross Expedition, the first British venture of the Heroic Age of Antarctic Exploration, sets sail from London. August 25 – 700 Greeks and 15 Englishmen are slaughtered by the Turks in Heraklion, Greece, leading to the establishment of the autonomous Cretan State. August 28 – Caleb Bradham names his soft drink Pepsi-Cola. September 2 – Battle of Omdurman: British and Egyptian troops led by Horatio Kitchener defeat Sudanese tribesmen led by Khalifa Abdullah al-Taashi, thus establishing British dominance in the Sudan. 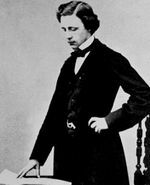 September 10 – Italian anarchist Luigi Lucheni assassinates Empress Elisabeth of Austria in Geneva as an act of propaganda of the deed. September 18 – Fashoda Incident: A powerful flotilla of British gunboats arrives at the French-occupied fort of Fashoda on the White Nile, leading to a diplomatic stalemate until French troops are ordered to withdraw on November 3. September 21 – Empress Dowager Cixi of China engineers a coup d'état, marking the end of the Hundred Days' Reform; the Guangxu Emperor is arrested. October 1 – The Vienna University of Economics and Business is founded under the name K.U.K. Exportakademie. October 3 – Battle of Sugar Point: Ojibwe tribesmen defeat U.S. government troops in northern Minnesota. October 6 – The Sinfonia Club, later to become the Phi Mu Alpha Sinfonia Fraternity, is founded at the New England Conservatory in Boston, Massachusetts. October 12 – The first town council is established in Mateur (Tunisia). October 15 The Fork Union Military Academy is founded, in Fork Union, Virginia. October 31 – Lutheran Church of the Redeemer, Jerusalem, is dedicated. November 5 – Negros Revolution: Filipinos on the island of Negros revolt against Spanish rule and establish the short-lived Republic of Negros. November 10 – Wilmington insurrection of 1898, a coup d'état by the white Democratic Party of North Carolina, begins. 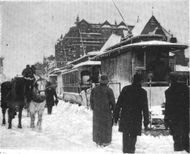 November 26 – A two-day blizzard known as the Portland Gale piles snow in Boston and severely impacts the Massachusetts fishing industry and several coastal New England towns. December 9 – The first of the two Tsavo Man-Eaters is shot by John Henry Patterson; the second is killed 3 weeks later, after 135 workers have been killed by the lions. December 10 – The Treaty of Paris is signed, ending the Spanish–American War. December 26 – Marie and Pierre Curie announce discovery of an element they name radium. December 29 (December 17 Old Style) – Moscow Art Theatre production of The Seagull by Anton Chekhov opens. Wakita is founded in the Cherokee Strip, Oklahoma. 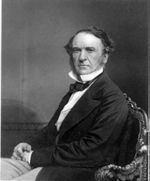 As a result of the merger of several small oil companies, John D. Rockefeller's Standard Oil Company controls 84% of the USA's oil and most American pipelines. Violet Carson, British actress (d. 1983). Clarence Williams, American jazz pianist and composer (d. 1965). Some sources give his year of birth as 1893. ^ Linfield, Malcolm (1999). "In Memory of Henry Lindfield – First Victim of the Motor Car". Lin(d)field One Name Group. Retrieved 2010-08-05. ^ "Henry Lindfield". Grace’s Guide. Retrieved 2010-08-05. ^ The National Archives and Records Administration (NARA). "Letter to President William McKinley from Annie Oakley" Retrieved January 24, 2008. ^ "The California Powder Works". Santa Cruz Public Library Local History Articles. Retrieved 2011-11-21. ^ Choveaux, A. (1925). "Situation économique du territoire de Kouang-Tchéou-Wan en 1923". Annales de Géographie. 34 (187): 74–77. ^ Benedetti, Jean (1999). Stanislavski: His Life and Art (Revised ed.). London: Methuen. ISBN 0-413-52520-1.